The Jake has deep, flat sides that provide tremendous wobble and flash. It is made of strong high-impact plastic, has a strong lexan lip, a built-in rattle chamber, and extra sharp VMC hooks. 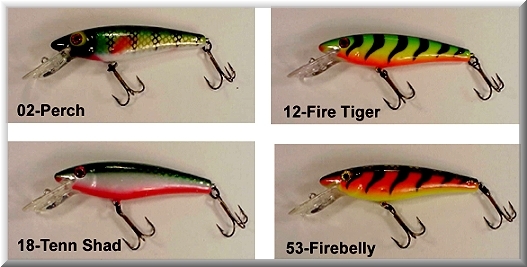 Available in three sizes 6", 8" and 10"; and five colors Perch, Firetiger, Tennessee Shad, Firebelly, and Silver Sucker. 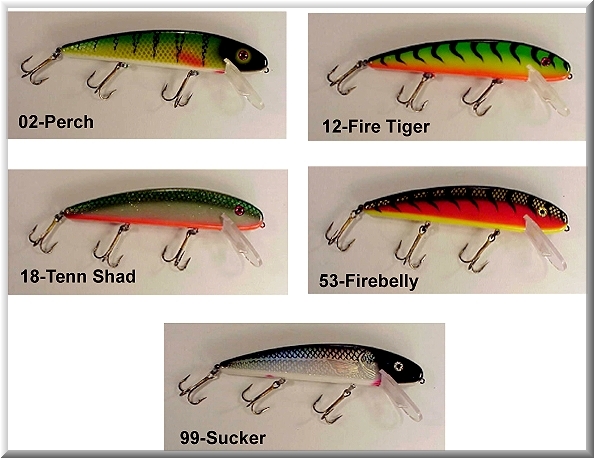 This is one of the best muskie lures on the market today! It was developed by Pete Maina, well-know guide and pro fisherman. The 53-Firebelly Is Out Of Stock!!! The Firebelly And Sucker Are Out Of Stock!! 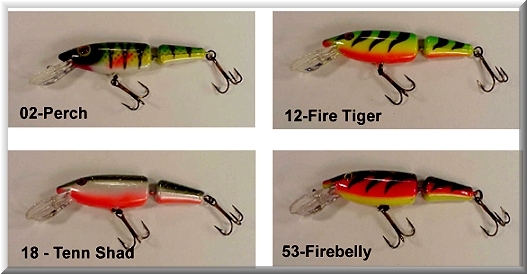 This quality deep diver crankbait is great for searching sharp breaklines, deeper structures, or getting down to suspended trophies in open water. Constructed of high-impact ABS plastic, with a one-piece molded lexan lip, weighing 3.5 ounces, and having a built-in rattle chamber, this deep diver is built to crash into structure and come out unharmed.